Home » Uncategorized » Circus? Or Termite Fumigation? Though it looks like the circus has come to town, a tented house usually means another kind of visitor has arrived in your neighborhood. And quite often, that visitor is a termite infestation. A process called structural fumigation is often used to control Drywood termite infestations. This method is often employed when there are extensive infestations, or where it’s not feasible to apply termite treatments directly to wood. During the termite fumigation procedure, a pest control professional will cover your entire home with a tent made of vinyl-coated tarps. This is done to minimize leakage of the fumigant, as well as to confine the fumigant to your house. Pest control specialists are trained to calculate the exact amounts of the fumigant needed to control termite nests. The fumigant will disperse throughout your house, filling all air spaces, cracks, and crevices, in order to control any termites that may be making their home in your home. A pest control specialist will carefully monitor the gas levels throughout the duration of the treatment. How Long Does Structural Fumigation Take? Typically, the structural fumigation process requires 24 to 72 hours, depending on the size of your home and the outdoor temperature. These two factors affect the amount of time it takes for the fumigant to reach proper concentration levels. 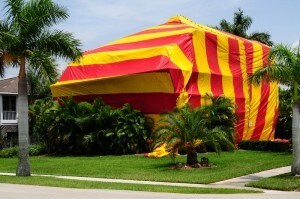 After the fumigation is completed and the tent is removed, the gas leaves your home quickly. A pest control specialist will wait six hours and then test the home’s air quality with a device that can detect even the smallest amounts of fumigant. Once the fumigant is completely cleared, the pest control specialist will let you return to a termite free home!